Hip-hip hooray, it’s a snow day! On Jan. 17, ETSU students received the day off due to the weather. It’ll be another year in the books for students who will remember their few snow days at ETSU. Last winter wasn’t a big event, but it seems to come every other year. In 2016, classes were out for more than a week’s worth of classes. A group of friends gathered together in Governors Hall this snow day to chill out. 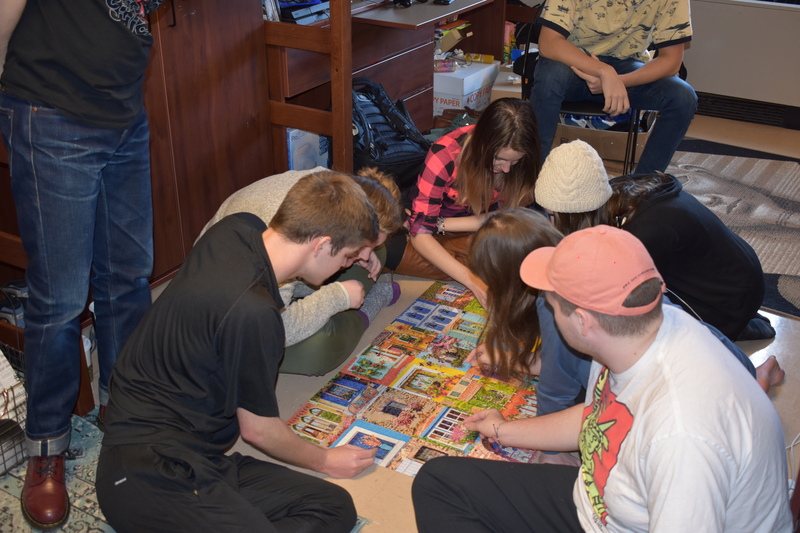 They put together a 2000-piece puzzle while listening to Abba’s greatest hits. When asked if they were going to do anything else on Wednesday, they stated they were going to participate in Chick-fil-a’s college night. On Wednesdays nights, college students can get a free chicken sandwich or eight-piece nugget if they buy a large fry and a large drink. ETSU sophomore Kaitlin Clark believes that a fun snow day activity is having a snowball fight. When asked how she spent this past snow day, her response was the following: “First I went to the Marketplace and ate with a friend, then we went out and took pictures in the snow. Then we went back to her dorm and played cards while watching TV,” said Clark. ETSU Junior Nobi Agwunobi’s advice for students during a snow day is to stay inside because it’s too cold to go outside. “But if you do go out I guess you can play in the snow, if that’s your kind of thing. If you don’t want to do that, you can stay inside and read a book or catch up on your homework. You could visit friends if you have any, make friends if you don’t. Watch some TV, if you own one. That’s it,” said Agwunobi. Roommates Miranda Liner and Caitlin Millsaps spent the day curled up in their cozy room. “I’ve been reading, watching YouTube videos and eating. I have not stepped foot outside once!” said Liner. “I slept a lot and ate mac and cheese and binged watched on Netflix,” said Millsaps. Millsaps believes that sledding is a fun activity students should take part in on snow days but, only when the snow is not powdery. The roommates agreed that the perfect snow day movie to watch is Disney’s Frozen. Whatever your choice for snow day fun was, make sure you took lots of pictures, because these are the days you won’t want to forget.